25, of Aroostook, Maine; assigned to 2nd Battalion, 6th Marine Regiment, 2nd Marine Division, II Marine Expeditionary Force, Camp Lejeune, N.C.; died Nov. 2, 2010 at Camp Bastion, Afghanistan, of wounds received while conducting combat operations. To honor 1stLt James R. Zimmerman, his parents, Mr. Tom Zimmerman and Mrs. Jane Zimmerman retrieved this stone from an outdoor fire pit near the lake on their property in Smyrna, Maine. Watch this video to learn why this stone is significant and what it says about 1stLt James R. Zimmerman. 1st Lt. James R. Zimmerman, born May 18, 1985, was Killed In Action on November 2, 2010 by small arms fire while leading his men when engaging the enemy. He was the commander of 3rd Platoon, Echo Company, 2nd Battalion, 6th Marine Regiment. He deployed June 13, 2010 to Operation Enduring Freedom in Helmand Province, Afghanistan. James was our third child. His older brother Christian and sister Meghan loved him sooo much. James brought laughter and fun to all of us! Growing up, he was dressed up as someone else more often than he was himself: Patch the Pirate, a old-time Preacher, a cowboy, Davy Crockett, an Indian, and a bike accident victim. Once while we were out skiing, he dressed like a white-camouflaged Marine and often he dressed as a regular camouflaged Marine. When he disobeyed he would be sent to his bed and he sadly would say, “OK Mom.” He would stay in his room until I remembered to tell him he could get off his bed. He easily said, “I’m sorry.” He grew up on our small farm in Northern Maine, playing outside daily. He enjoyed the farm animals: Rosie his cow, Chico his horse and his black lab-shepherd mix Bonita. The dog was always by his side, in his bed, on his lap in the recliner, traipsing beside him in the woods or where ever James journeyed. His father and I gave the two-week-old Rosie-cow to James as a gift for his sixteenth birthday. He wanted to learn to rope a calf; he never did – but instead walked her on a dog leash. At times James could be found curled up beside Rosie when she laid down in the hay to nap! At church James looked out after the little kids. Well… he looked out for kids at restaurants and Wal-Mart too. Guess he was always looking out for others. After James’ death we received a sympathy card from a young man. His note described how other kids on his team had been picking on him while playing a church game. His brother told James about the teasing. James took the boy on his team and the boy wasn’t picked on anymore. Another time we were climbing Mt Katahdin with some church kids. Selena was wearing shoes that belonged to her mother. They were too small and her feet blistered. James carried the girl and her pack for the last part of the descent. He always seemed to carry someone else’s pack. I was told he also carried other soldiers’ packs during trainings and on Marine humps. For twenty years our family made monthly visits to the local nursing home and had a church services with the residents. We sang and played music as a family. James was so comfortable going there, singing for the elderly and visiting with them: shaking hands, hugging the women and talking military to the veterans. He would often sing with me, his mother, as I played the guitar and his sister played the piano. He loved being a counselor at Camp Good News and was always watching out for his boys. Wherever James went, his cabin boys followed, sitting all around him, clamoring for his attention. He was their lifeguard and also helped teach them archery. He played with the kids during the big games that were held in the evening. He sat with them for meals. Whether it was at a church, a nursing home or a camp, James loved to be involved with people. The first Marine recruiter call came when James was ten years old. He had sent “the card” in on his own. The nice Marine told him to keep doing well in school and he would talk again with him later! The second call came at age fourteen. When James was seventeen-and-a-half, we drove him to the MEPS center in Southern Maine to give his life to the US Marine Corps. I have a picture of James raising his hand to be sworn in as a Marine. He and I didn’t know what that really meant. James joined the US Marine Reserves in Maine for a year and then he was offered a scholarship to NROTC at the University of Maine, in Orono. He wanted to be an infantryman and didn’t want to leave the men in his unit so he refused the offer. Five of his superiors got on the phone and told him he needed to do this. He needed to be a Marine officer. The next four years of study were very hard consisting of general courses that James didn’t have much interest in, sprinkled with physical education, military history, studying the different wars, and leadership. James excelled in anything that came close to the Marines. I believe he excelled in his leadership studies because he loved the men he was in charge of. While in the Marine Reserves, James volunteered at the Topsham Fair for security details. A woman who worked the fair wrote that for the seven days she knew James, she felt safe when she saw him report for duty. Lynell Winters, a veterinarian student at UM Orono, met our young Marine while he was in training to be an officer. She was one year ahead of him. They were mostly apart – she moved to North Carolina for Veterinarian studies while he finished NROTC. Then he was Commissioned II Lieutenant and sent to Quantico, Virginia for Officer Training. They traveled back and forth to see each other and married just one year before James deployed. Lynell moved to Rhode Island for a Veterinarian Internship. The year before James’ deployment—not to Iraq—for the war had moved on to Afghanistan, he was in charge of a Marine platoon. They trained together preparing to fight in Afghanistan. One weekend James was off duty and had traveled the one-and-a-half hours to see Lynell. He was notified that one of his men was in trouble for the third time. James didn’t need to return to base, but he did in order to be with his young Marine. He told us on the phone that so many of his men came from troubled families. He said how much he appreciated his own home and family. When this Marine went before the board, the members wanted to discharge him from the Marines. James stepped forward with him. He told the board that his man was a good Marine and wanted him to deploy to Afghanistan with his unit; Joshua spoke at James’s memorial service at their Patrol Base in Afghanistan. James believed in people and they came to believe in him. Joshua contacted his mother asking her to attend James’s funeral and represent James’s men still fighting in Afghanistan. At the funeral she waited in line for hours to hug us and tell Joshua’s story. In a phone call James told us of a safe school that his unit set up and patrolled for children who had not been schooled for nearly six years. He told us it was “his” school. James spoke of wanting to put together a safe area for a bazaar so the Afghani people would have a secure place to shop. As a platoon leader Daniel met with the local Afghanistan tribal leaders; I was told they liked and trusted him. James wanted to take care people who could not defend themselves. In Arlington, after James’s burial, we all gathered at a local restaurant set up by one of James’s commanders. His men surrounded us to share stories about James. At a table I had a Marine seated on each side of me holding my hand; each took turns telling us stories about James and his men. His platoon was known for using the most ammunition and going on the most patrols. As platoon leader, James had to lead many patrols and chose to join patrols even when he didn’t have to. He would step aside and let his Sergeant take charge but felt the need be with them. On the day he died they had already patrolled an area. Having previously encountered two firefights, they were heading back to base when they heard enemy fire. They turned back to fight. James and Sullivan were sitting in a ditch. Both had full protective gear on. A spray of bullets came and both men were hit. A bullet hit Sullivan on his vest and another hit James just barely beside his vest. The Lord chose to take his child James home that day. Four years later at “The Run For The Fallen” in Southern Maine, the Marine Color Guard Jay Foley, who had been with James’s Platoon and under his command in Afghanistan, told us that unlike most officers James would sit and eat with his men. He would spend off time with his Marines rather than with the other officers. James loved the men he commanded. It is no wonder why James turned out the way he did. His parents Tom and Jane Zimmerman taught him the more important factors of life and he learned them well. Loved this interview. Thank you so much for posting it on Facebook. Always a wonderful tribute to James….always a tribute to Jesus! James was who he was because of his wonderful parents, Jane and Tom….and Jesus! Lynel was much blessed to have him in her life. Tom and Jane so many wonderful memories or your lovely family— Our children were older then James in the Christian school . We as parents were working together as families for our children. I learned to love and appreciate you and your family so much!! We don’t under stand the why of life yet we know some day we will under stand it better. James had so much going for him with a great family and support. Love you Tom and Jane!! When we are weak Christ will make us strong. I have seen the strength of Christ in both of you during this difficult time. Your reward will be for you in heaven. I thank God for the memories of James and your family!! Well done Tom and Jane! Your faithfulness has always been a great encouragement. This video is wonderful and quite a tribute to James. So blessed to have you as friends! The Summit Project is a great endeavor and a perfect way to honor James and so many others who sacrificed their lives for their country. Everyone know the Zimmerman’s and why James was loved as he was…. Such a wonderful and caring family with lots of love . this is a wonderful tribute, thanks for sharing, I enjoyed it so very much. he was a wonderful young man and it because of his wonderful parents and upbringing. My wife and I spent our summers at a camp on the lake near Jane and Tom’s home. After listening to this interview I regret that we did not get to know this family better. Their family did indeed practically live on or in the water. We marveled at their endless energy. We were deeply moved by the loss of their son. I just got off the phone with my sister to alert her of this project. She lost a grandson, Jason Dore, from Bingham Me. and will be alerting her family about this project. Thank you Penny for posting this interview on FB. May James and Jason rest in peace. I had the honor and special privilege to carry the memorial stone of your remarkable son – First Lieutenant James R. Zimmerman, U.S. Marine Corps. Thank you both for joining us on this inaugural hike. James loved drawing, carving, outdoors, his backyard where he grew up, sailing and his horse, Chico. James also loved bonfires and his memorial stone was taken from his family’s lakeside fire pit where James enjoyed hours of joy and love with his family, and a favorite of mine as well – grilled red hot dogs. James was an avid outdoorsman, an athlete, a true gentleman and a compassionate warrior. He always had a smile on his face. He made others a priority by listening and leading. James never tired of giving his mother a hug. I was touched to meet James’s parents Tom and Jane and learn about James’s humility, grace and dedication. Learning about James has made me a better leader, stronger servicemember and more compassionate public servant for others. His lifelong ambition was to serve in the U.S. Marine Corps and dedicate his life to his country. Throughout his military career, he aspired to lead by example and loved his men, who in return loved him and respected his leadership and example. I think he would have liked a project like The Summit Project. I am extremely honored and truthfully, quite humbled, to have carried his memorial stone. My hope is that through the act of carrying his stone for the hike and carrying his story for a lifetime, I was able to pay proper tribute to an extraordinary Marine Corps Leader, a compassionate warrior, a humble public servant, a principled and devoted husband and son and a true American hero. I knew early on that I wanted to carry James’s stone. In fact, I think it is more accurate to say that James chose me, rather than me choosing him. We have much in common. Both Marine officers. Both very proud of our home state and both very dedicated to God and country. When I met with you both last year, you welcomed me into your home, took all the time to share James with me and you would not let me leave without a beef stew dinner. I felt like family then. I know I am family now. I am so honored to know you and call you friends. I am thankful for the life lessons you’ve imparted upon me by sharing your son’s memory. I thank you for your friendship and mentorship. I have learned much about James through you and those who knew him. I think about the stories you shared as James the protector, and faithful servant of God. I imagined what it might be like to meet James before his death. He would have the same smile as his mother, Jane. He would have the same gentle kindness of Tom. He would place others needs in front of his own and he would always stay calm in crisis and say hello to everyone he met. It would take him forever to walk across the University campus. I tried to emulate James through the TSP at BSP weekend. Taking the time to greet others, demonstrate my sincere gratitude, listen to their concerns, find solutions, integrate our team, bring out the best in others, and remain focused on the mission. Like James, I wanted to be an example of servant leadership. I always tried to remain upbeat, positive and alert – just like James would. I tried to give credit to others, even when faced with personal praise and honor – as James would. I tried to find new ways to challenge myself and grow – as James would. I was so proud and so honored to carry James’s stone. It is a popular one because James demonstrated the very best in what’s good in America and our state of Maine. He was smart, fun, dedicated, capable. He was mentally and physically fit. He was resourceful, strong and hard working. He was grounded, humbled and he knew what he stood for. He protected others and was part of something bigger than himself. I hope the weight of James’s stone has allowed me to share in the weight you must have felt when you lost him. Tom, you said it best “when that weight gets heavy, stop thinking about yourself, and I think you’ll find, that weight getting lighter”. It was my honor and personal privilege to carry James’s stone and be able to look you both in the eye and say with 100% assurance that James’s memory lives on in a living memorial where countless more hikers and trekkers can learn the life of your son and because of that connection – they can make better decisions about leadership, service and giving back. I hope that my leadership to TSP can allow me to continue the work of James and our other fallen heroes toward creating a safer, sounder, more just America. Thank you Tom. Thank you Jane. Thank you for getting behind me with the concept of TSP and entrusting the memory of your wonderful son to me and others. Maine heroes are NOT forgotten. Tears in eyes. Thank you for understanding James. My son Jon was one of James best friends growing up. Jon and his wife Laura had twins 7 weeks ago and named the boy James in memory of him. Our little James has been fighting for his life and I have envisioned James spirit rooting him on :),little James is a fighter just like James and my prayer is he grows up to become the awesome young man James was. Thank you David for the memory of James,so proud of the man he was and the memory he has left for us to follow!! The first 10 days of June 2014 I had the great honor to ride with James from Southern Maine out to Montana and back. We rode along a large portion of the Historic Lincoln Highway from central PA to the middle of Iowa. We stopped at the Freedom Rock in Sac City Iowa and paid homage to those veterans of all conflicts who made the supreme sacrifice. We rode the Chief Joseph Highway in Northern Wyoming and climbed to the summit of the Beartooth Pass in Montana, what a wonderful adventure it was. 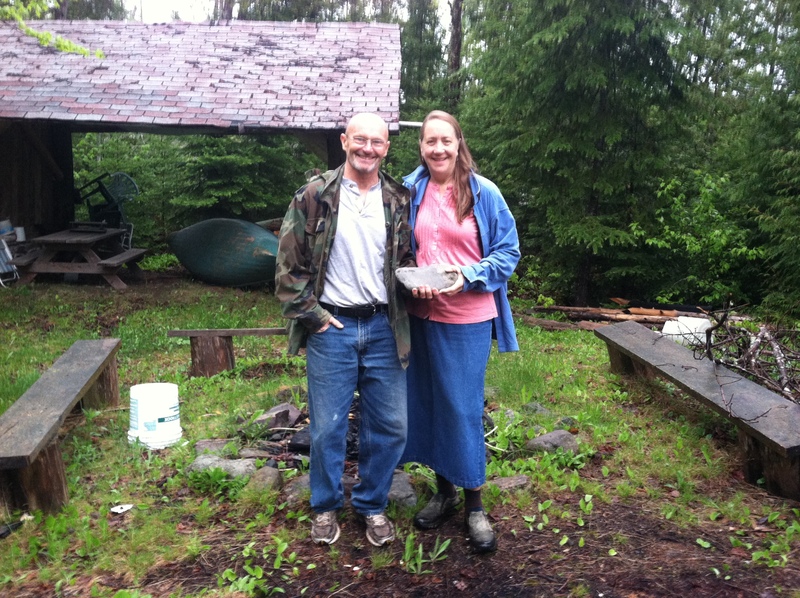 We returned home through a portion of Ontario Canada and arrived in Southern Maine safely on the 11th of June. I can’t adequately put into words what a privilege it was to have James accompany me on this trip. As we passed and saluted memorials to veterans all along the way and I explained and told James’ story and the story of the summit project over and over, I was humbled by the attitude of the people we met, a far cry from the reception of vets in the 60’s. Rest assured that they are not forgotten. It was on December 13, 2013 that I first heard about The Summit Project. My mother, an Army veteran, daughter, Heather McGlauflin, a former Marine and Eastern Maine Community College veteran adviser, and I where attending the dedication of The Robert E. Gilbert Veterans Lounge at the College. The Keynote speaker was Marine Major David Cote. He spoke of his mission to challenge the living by honoring Maine’s fallen heroes since September 11, 2001. I learned that Maj. Cote visited each Maine family and collected information about our fallen heroes lives. He also collected stones of significance to each family and had them engraved with the names,rank, dates of birth and death of each soldier. The Summit Project, the first living memorial of it’s kind in America was underway! The inaugural hike was planned for memorial day 2014 up Mt. Katadin. Having climbed Katadin 3 months earlier with my cousin, Robin Pare’ an Army veteran; my daughter Heather also wanted to make this trek. Now we had a reason, much more important than any personal goal. We were psyched! Memorial day 2014 at Baxter State Park was a memorial day like no other. The Stones and the stories of the soldiers they represent were passed from the hands of boy scouts, to bikers, to families, to hiker. The whole town of Millinocket lined the streets as the Patriot Riders motorcycle brigade carried the stones from Portland to The Twin Pines Campground. There families received the stones and passed them to the hikers to the sounds of bagpipes. It was a day of awe and reverence. We were anxious and excited that the next day, a day that had been planned for for a year was finally here. The day of the hike up the Owl Trail was the day, I learned about James. Three teams of 12: The Red, White and Blue teams had formed quickly. My cousin Robin and I had not made the cut to be official hikers but Heather did. Nonetheless, Robin and I were determined to go to support TSP and Heather in any way that we could. The morning of the hike, Robin and I hung back a bit from the official hikers as we were unofficial or “rouge hikers”. We soon found that we were not the only “rouges”. On the trail we met Tom and Jane Zimmerman. We learned that they are the parents of James whose stone was being carried that day by Maj David Cote. We cried as we learned that James had died at age 25 on November 2, 2010 in Afghanistan due to combat wounds. These two loving parents were living every parents greatest fear. As a parent, I have long thought that a loss of this magnitude would be too much to endure. I would crumble to dust. I am sure that without Faith in God this would be so. While listening to Tom and Jane speak of their beloved son, his service to our country and ultimate sacrifice; I knew that I was in the presence of God’s Grace. I learned that they are a faith based family. James was raised with the foundation of faith as his rock. There in the mist of unspeakable loss, I felt the presence of God with us. That is what carried us up the mountain that day. I knew that I wanted to be a part of The Summit Project and to learn more about 1st Lt. James R. Zimmerman. The next hike was October 4,2014 up Cadillac Mountain in Arcadia National Park. This time, I MADE THE CUT! I was so excited to learn in August that as an official hiker, I would have the honor and privilege to carry the stone of your beloved son who died in service to our country. I learned that James’ stone was taken from the family’s fire pit by the lake. He loved a bonfire and made a fire pit as a first thing he did when he got his first home. He grew up in Aroostook and graduated from a Christian Academy where is father and mother both work. I learned that James was a loving son, gave many hugs to his mother, was very close to his sister Meghan and hero to his brother Christian. He was an artist, craftsmen and animal lover who loved to draw and build things. James was a born protector. He was living his life dream having always wanted to be a soldier. At age ten he got a recruiter call after completing a card expressing his interest. He enlisted in the Marines at age 17 and became an officer after he graduated from the University of Maine in 2008 where he met his wife Lynel, a veterinarian. She ran Boston Marathon 2012 in his memory. James was resilient, responsible and respected. He never gave up even when he struggled or failed. He forgave his shortcomings, took responsibility for his actions and stood up for others and what he believed in. He was a fearless leader, champion for others, who always had his men’s backs. “Z” was loved. He will never be forgotten by those who knew him and those who continue to learn of him and carry his stone. He was remembered by one of his men in a Memorial Day address 2012 in Virginia. He is remembered annually each spring since 2010 by The Zimmerman Fitness Challenge at his Alma mater The University of Maine. James was physically fit and mentally strong. Funds were raised for a perpetuity scholarship in his name.. The more I learned the more I felt a kindred connection to James. I think he must have played a part in me being selected to carry his stone. I had failed to make the team at Baxter State Park but didn’t give up, went unofficially and learned about him for the first time. I think he was rooting for me! In preparation for Cadillac, I wanted to honor James by working hard to become more fit. James was my inspiration for workouts to push myself. I wanted to be ready mentally and physically. James has a BIG stone. The day of our hike, I was worried if it would fit in my pack. The day of the hike was rainy and gray but that did not dampen our spirits. Emotions ran high and we were focused on our mission. I was on Team Tarn. Several of us had gone on practice hikes, twice up Dorn Mountain and once up Bald Mountain in preparation for this day. At last we were all together to work as a team. TSP had grown from 3 teams of 12 at Baxter to 4 teams of 20 for Cadillac. Hikers from various backgrounds and experience all coming together for a common goal. A well executed plan was put into motion. Four teams converged up four trails to the summit in remembrance of our fallen heroes. The Summit Project is a community of Maine’s fallen heroes united as a family. This family has grown by sharing it’s stories and support. During the hike, we helped each other when the going got tough. Honestly, despite it’s size, I never felt the weight of James’ stone in my pack during that hike. What I felt was it’s warmth and protection. James “HAD MY BACK”! I continued to feel warmed by James at the summit of Cadillac as we gathered in a ceremonial circle in a driving wind and rain. I thought of the warmth of the fire pit from where Tom and Jane collected James’ stone. I did not want to give up his stone when it was time for me to place his stone with the others at the summit. It was not until we came down from the summit to be reunited with the families at Thompson Island that I felt the weight of the loss of James. Never a weight on my back; James’ stone was my warmth, my protection, my motivation, my strength that day. I was so very happy to be reunited with his parents Tom and Jane. I met for the first time, his beautiful sister Meghan, her sweet three year old daughter Haley and 5 week old infant son Miles as well as several his cousins. It was when I gave James’ stone back to his family that I felt the weight. I felt the weight of loss of James in my heart. I know I can never take away their pain. But I can tell you that I am grateful to know that such a wonderful man lived. He will NEVER be forgotten! I am humbled by this experience. It is with pain and pride that I will remember this extraordinary young man, taken from us too soon. A young man with his father’s smile who believed in God, country, service and sacrifice. Learning about him makes me want to be: a better person, champion for others, forgiving and resilient. God Bless You All. On March 6, 2015 I had the honor of carrying the stone of First Lieutenant James R. Zimmerman, U.S. Marine Corps, through Portland, ME. Although I never met James, his memory will be remembered through this project and I’m glad I was able to be apart of it to make sure Maine hero’s are not forgotten. The night before the ZFC I traveled to Augusta to meet up with two members of my TSP family, Ted Coffin and Andrew Coleman, and even though I hadn’t seen them in a few months I was welcomed right back with open arms. I said my goodbyes and then received the stones of James, Brandon Silk, Christopher Gelineau, and John Brainard for our team and started my travels back home to prepare for the morning. As the miles passed by, with the stones in my passenger seat, I felt a tremendous emotional connection, that I could not withstand. I had only made it to Newport when I had to pull over and look at them. The first stone I held in my hands was James’. A mere rock that had been overlooked for years, now is a symbol of solidarity for the family that lost a precious part of their lives and I found myself blankly staring at James’ for 20 minutes. The stories I had heard of James all came flooding back to me while I was sitting at the rest stop. It was quite overwhelming and I started to doubt my abilities to carry it the next day. From every source I researched about James I learned he was an excellent leader his men looked up to, that he pushed them hard, and was always there for them when the times got tough. I decided that I would let James push me and his memories guide me through the day and the ZFC. I had never met James, but I could put a voice to his picture in my mind. On the day of the ZFC, I met up with our team, Tony Llerena, Spencer Smoot, and Tom Hayden, and handed out the stones we would be carrying all day while meeting them, essentially, for the first time ever. We did the ZFC a little differently than the other teams as we carried weighted rucks the entire time throughout all the evolutions and movements. What we were doing was in the memory of a soldier that hadn’t come home and for a family that would trade anything for one more day with them. It wasn’t ever about our ego, pride, or to say “look what I did”. Time did not matter; only the team mattered. Before the start of the ZFC, I met up with Tom and Jane Zimmerman and introduced myself. They are truly amazing people. They encouraged us all and participated in the Challenge as well. During our pack run I started noticing what a difference we were making in the morale of those around us. Many people that knew James would come up and touch my pack or say a kind word on what we were doing. I knew at this point that all my doubt from the night before was gone and we gave the field our very best that day. It was a day of never leaving a teammate behind to struggle and forming our own bonds of family with each other that afternoon. That is what James was all about and throughout our trek I could hear him saying “we got this”, “this isn’t hard”, and “help your team”. At the end of the ZFC and I introduced my wife and son to the Zimmerman family. TSP is all about family bonds and I wanted my family to know theirs. We all have different backgrounds, but the family bonds we build around each other have the power to lift a spirit even on our lowest day. I am honored to have carried James’ stone and memories that afternoon, but this was just the beginning of the weekend that I spent with them. On Sunday it was time to uphold another part of the weekend I was looking forward to with James’. His stone was taken from their family fire pit where they have forged memories over the years and I brought him to mine. Throughout the afternoon my son, who is 5, helped me haul brush and tree limbs to our fire pit. It was a nice 60 degree day for some hard work and a bonfire. I placed James’s stone near me, just before touching off a 6’ fire in his honor. I’m sure he was smiling ear to ear. Hard work and being outside is something that both of our families love and I’m glad I could share that. I sat and reflected on the event the day prior and went over how things could have been done better and how I could have been a better leader. My next outing will be better due to this one. It’s all a learning experience and was very thought provoking. It was nice to have James’ ideals in my head while mulling it all over. For my last adventure of the weekend I participated in the Healthy High 5K on the Orono campus on Monday. To say I didn’t look like the other racers is an understatement. I was dressed in my work shirt and heavy cargo shorts with no performance gear and no running garb like the other 500 people. I did, however, have my ruck and a sandbag on my shoulders. It was a very uncomfortable and heavy burden of 150lbs extra for the TSP families. It was the physical weight of a person that would be a constant reminder to me that we are never alone. I had packed all 4 of the stones we carried over the weekend in my ruck: Zimmerman, Brainard, Silk (who is from Orono), and Gelineau. The date of April 20 is important as Gelineau had given his life on this very day 11 years prior. It was threatening to rain on us at the start and all I heard was grumbling from a lot of people that they might get wet. HA! That is what people were worried about? It seemed petty to even hear this after the gravity of the weekend had set in. I was welcoming the rain with open arms. It was one final tribute to the amazing men for which we gave the weekend; to be completely humbled by the load and weather. The weather did not disappoint me. I finished in under 50 minutes and was met by Tom and Tony at the end with a warm embrace of new found friendship. They had run the 10K after we had all battered our bodies at the ZFC, too. The bonds we make in life with complete strangers that hold the same values and goals as us are simply amazing. I learned so much about myself over the weekend I spent with James’s memories. I’ll never get to meet him, but his ideals and strengths will be taught to another generation and passed on. I will see to it. MHANF. Hi there, I am posting this to tell you about the hike I took in honer of 1st Lt. James R. Zimmerman. My JROTC program climbed Mt. Bigalow just recently. It was a great experience for me, as-well as my peers. I personally felt felt honored to carry James stone, I have a family member in the service, and I feel great when I give back to our community and when remembering the sacrifices that have been made. One of the biggest things that I noticed between my group was a huge sense of camaraderie. When one person was struggling, or needed a little push, we were all there for each other. We had all made it to the summit and off the mountain safely. I feel that James would have done the same. I remember in the video of James parents, that they had told a story of how James helped one of his men who was facing being kicked out of the service. He had supported his man and convinced the board to give him a second chance to serve his country. And, it is nice to know that there are many people who share the same great traits as James. I think he would be proud to see all of us here, working together and helping each other out. The Summit Project at Baxter State Park weekend was the culmination of so much for me. Having met you both in 2011, only a few short months after James’s passing, it was both of you who were sharing your story with me. Each year, for the next two, I looked forward to seeing “Tom Zimmerman” in the event registration. Knowing that we shared grief over losing a loved one, it was our short conversations that raised my spirits. This hike specifically, coupled with your openness and willingness to speak of James, was the opportunity to better understand your son. I’m quite certain James was with us, a silent member of Team White, as we ascended Owl Mountain Trail. More than just a stone in my pack, he was in God’s beauty all around us. From the gorgeous stand of portly maple and birch glistening in the early morning sunshine, to a stoic stand of tall spruce with a carpet of lichen, to the gruff rocky outcrops high above the treeline. He was there. You both spoke so eloquently of James’s ability as a leader, the way his men excelled with his direction. I purposefully situated myself a few individuals ahead of you as we started, wanting to watch, listen, and learn. It quickly became evident, where James got his leadership from- it was the outstretched hand of you Tom as the going got a bit tougher, it was the song and spirit of you Jane as the miles wore on, and it was the stamina of you both combined throughout. On our entire ascent, James was there. I appreciated listening to stories of James as a young child, trying to find his way; of his pickup truck and how it’s not quite your type of vehicle to drive, but it’s still a piece of him; and finally to the more sensitive, personal side of relationships after James’s passing. It all was very real for me, and I found it very easy to relate. With each story, I came to understand him better. As the three of us, and our Team White members exited from the scrubby brush that obscured the last quarter mile of the trail near the summit, I was immediately taken aback by the enormity of not only the patchwork of granite rock and green forestland rising further above me, but by the sense of being in the right place at the right time. As I turned 360 degrees around, looking north, south, east, and west, it was what was above me that really resonated. A peregrine falcon; a symbol of liberty, freedom, and victory, moved effortlessly in the air currents above. It was at this moment, as if selected for me, that I knew James specifically, but all of our Fallen Heroes, were with us in spirit. As we organized the stones we’d carried for the circle ceremony, I kept watch of this falcon. As one of our team members, and active Army member, unfurled the Stars and Stripes he carried with him from Afghanistan, with its gritty sand still inside, this falcon disappeared. It was almost as if on cue, affirming a successful job well done. You both embody the character and compassion I heard many speak about James having. Both hiking with stones, and learning of other Fallen Heroes from their Gold Star Families, it was your captivating and heartfelt speeches of their lives, a man and woman. As James would have done, you drew on personal experience to create a picture of their lives. One picture that lives in my mind, is of Tom leading us in prayer, circling the stones as we gave praise for their sacrifices. I’m certain that James provided this same moment of reflection for his men, too. One of my most memorable moments of the entire weekend was coming back from the hike. As I exited the building to applause from the families and TSP staff, a feeling I was not prepared for, I saw you both line up ahead and present other Gold Star Families with their loved ones stones. While waiting, I lost sight of where you both ended up in the line of Gold Star Families. As I scanned the long line of Gold Star Families, I was truly moved when I finally spotted you both again. It immediately made me think of how James must have felt, completing basic training, graduating, and then marching in to search the crowd and finding your proud faces. It was an honor to carry James’s stone, a privilege to understand James as a son, and it’s truly inspiring to watch you both embody James’s legacy by helping other Gold Star Families through their journeys. That was so beautifully said. Thank you. Jane is my sister, Tom, my brother-in-law. James was my nephew, cousin to my children. TSP has inspired my family to move forward, to know and honor other fallen heroes in a way I wouldn’t have had the opportunity to. Your words of reflection and inspiration heal another piece of my heart. I live on a farm in New Gloucester. Not long after James was lost, I was in the barn and heard a noise. I stepped out at the same moment that an Eagle swooped low in front of me. He was close enough for me to see his eye, his talons and his tail feathers. He circled three times and flew off. Since then I have seen an Eagle several times in different places. Its moments like these that connect me to James. I participated in a Goruck event on Friday and Saturday June 5-6th, in which several stones from The Summit Project were carried by all members of the team. I was privileged to speak for your son at a ceremony we held among the team to remember the fallen. I did my best to get to know him through newspaper accounts of his passing and the very moving video of you both on the TSP website. While I’m sure I only scratched the surface, what I found truly resonated with me. It is a rare combination of courage to both fight to stick up for the smaller kid and be unafraid to hold your mother’s hand in front of a unit of marine’s. I think it speaks volumes that both his classmates and his men remember him as having changed the course of their lives for the better. His ethos that when knocked down he would always get back up is one of the chief virtues that I aspire to (but do not always attain). We are all flawed, we all fall down, but it seemed like your son had truly understood that the measure of a man is how willing he is to persevere. His drive to protect those who cannot protect themselves, his genuine caring for those around him and his commitment to strive to be the best he could be shone through in your video. Growing up in a Navy family, Marines were always in the background of my life as silent, benevolent protectors. As I grew older and families around me experienced some of the same loss that you have I came to understand a little better what the price of that sense of safety is. I cannot say that I deserve it at that price, but I can say that I am profoundly grateful to your son and to you. Your son’s commitment to God and Country and the sacrifice he made for all of us here at home is not forgotten. I wish you all the best and thank you for the opportunity to get to know a little bit more about your son. I just wanted to tell you how honored I felt being able to carry James stone during The Summit Project comes to Lincoln. As I read and listened to you speak about James it showed me how proud and happy he made you,and it reminded me of how proud my son has made me. While waiting for the walk to begin I was able to share James story with several olderMarine veterans from the Lincoln area and amazes me the bond that is created by Brothers in arms. I was also privileged to meet and walk with Dustin Harris’ mom and dad which ment a lot to me. As we walked and I thought about what to say at the ceremony many things raced through my mind about James. James ” loved the men he commanded”. As those words came to mind it showed me James “Got It!” I too am in the military and have lead men on deployments and with that same mind set that the men under your command comes first. The sacrifices that James made for his men were very ever dent in the testimonies and respect that was shown to James. He upheld the core values of the Marine Corp- Honor, courage, and commitment. Finally I want to say again Thank you for letting me get to know James. It was my pleasure to meet Jane and Tom at the Run for the Fallen back in August, and to meet James’ grandmother Althea on 18October. On 17October, it was truly a privilege and honor to carry the memorial stone engraved with First Lieutenant James Russell Zimmerman’s initials. This solid broad stone from the family’s fire pit had experienced the trials of heat from fires, and the cold of Maine winters. I took note of its resilience to extremes and thought about how it may have represented stages of James preparation for his life as a Marine officer. As the Team Lead for hike team KEBO, my pre-hike preparation in learning about James showed me over and over again that he was an accomplished officer and leader. I found lots of evidence in the family interview posted on the TSP website, and from a phone call with one of James’ college roommates during his time in Orono (MK). Some of the stronger signs of Leadership skills that rang out for me were that James was totally faithful to his Lord, and to his family. He was a consistent and successful protector of anyone that needed help. He pushed himself to become excellent, and pushed his teammates to excel and be ready. Stories of his workout routines were impressive and daunting to me. For James, they were a part of the preparation for what was to come. A mark of an effective leader is that they have successful and accomplished followers. He was completely loyal to his men and the missions, and his men were loyal to him in return. With all of his dedication to becoming a Marine officer, I was told that he often had a smile or grin on his face. I also learned that while he was in Orono, he and his roommate adopted a pair of stray cats. I found the balance of his strong and soft sides to show a well-rounded view of his personality. On our hike up Cadillac Mountain, I took comfort and strength from the weight and presence of James’ stone. I was responsible for 20 hikers that day, and had met 17 of them at the Thompson Island staging area for the very first time. With the hubbub of check in, stone assignments, bathroom breaks and short hike briefings, we didn’t have a lot of time to “build our team spirit”. However, we were the fortunate in that we were allowed to borrow one of your family flags. The team found the symbolism in that it was YOUR flag, and it became our common item to follow. Our hike started with a short rain shower as we hopped off the bus. We experienced warm winds on the climb up, a very short burst of tiny hail, and cool breezes when we arrived at the summit. As we followed your flag up the mountain, the team of strangers shared stories, developed relationships and bonded into a unit of teammates with two purposes: honoring the teams’ heroes, and keeping all of their stories alive. While I hiked , I found that myself thinking about James’ reputation. His active style of leadership helped me to make some confident decisions that morning during a brief period of uncertainty, and then to go forward trusting the new plan that I had formed. My time together with James’ stone left a positive imprint on my thinking about the value of action in leadership. Please know that I treasure those hours that I got to honor James that day, and that it is now a part of my life story. Going forward, I will work to improve my own leadership skills by putting one of James’ key strengths into practice. Namely, I will work harder to support others as they overcome obstacles and develop new skills. P.S. On behalf of Team KEBO, I am extremely grateful for the family’s trust and help in executing of a complex plan of flag handoffs involving Tom, Althea, Tony, Scott, and myself. I FIRST LEARNED about The Summit Project in 2012 and its mission to honor the fallen immediately resonated with me. As a veteran myself, TSP provided an outlet for the desire to remember the fallen, express gratitude for their sacrifice, and support their families. A LITTLE OVER A YEAR AGO, I set goals to complete 10 Tough Mudders in preparation for carrying a TSP stone through the World’s Toughest Mudder in 2015. “Tough Mudder” is a 10-mile obstacle course; and the “World’s Toughest Mudder” is a 5-mile loop that participants complete as many times as they can over a 24-hour period. I REQUESTED JAMES’ STONE because of the parallels in our biographies, including close birthdays; longtime aspirations of military service; and even deployments around the same time. After receiving approval in spring to carry James’ stone, I started training with a backpack loaded with a medicine ball and labeled with nametapes that read “In Memory of 1stLt Zimmerman” and carried that same pack through all my Tough Mudders. At World’s Toughest I also decided to dig into storage and complete the 24-hours wearing only standard-issue military gear from my time in the service. If it was good enough for James in Afghanistan, I figured, it was good enough for me in the Nevada desert. Plus, I expected it would pique people’s interest and initiate opportunities to tell his story. IN MANY WAYS, the entire experience leading up to and including carrying James’ stone went just as I hoped: Taking to heart what James’ father, Tom Zimmerman, advised hikers to do in the TSP video, I went out of my way to help other people out on the course, offering an extra boost or an extra hand-up before continuing along the course. James’ story inspired me to push harder and kept me from giving up. There was one moment in particular, only few hours into the 24-hour World’s Toughest that I was confronted by objective physiological failure, disqualification, and a very premature end to my journey. And while James’ stone on my back wasn’t making the obstacle any easier, his memory certainly pushed me beyond where I thought my limit and kept me pushing onward. BUT I WAS TAKEN OFF-GUARD – and I’ve been struggling for over a month – with how different I feel compared to what I expected. The more I have reflected on James’ life and what carrying his stone meant to me, the more I have realized how mistaken I was – about everything. I am still striving to understand the gravity of James’ life; and his sacrifice; and what it means to truly honor him. “HONORING THE FALLEN BY CHALLENGING THE LIVING” goes far beyond the challenge of summiting a mountain or negotiating an obstacle course, I’ve begun to understand. It is when we push our egos to the side; when we go outside our comfort zones; when we offer our time, attention, friendship, or a helping hand over a wall that we honor them. When we recognize that these fallen heroes’ lives were oriented toward – that we recognize we all have a duty to orient our own lives toward serving others. “LIVING A LIFE WORTHY OF THEIR SACRIFICE” goes far beyond seizing the moment. It means emulating the best in our fallen heroes so their sacrifice is vindicated by their continued positive influence, through the selfless actions their legacy inspires us to take. We shouldn’t simply take a moment of silence to remember them – I SAY THEIR MEMORY SHOULD SPUR US INTO ACTION! Rather than mourn their loss, we should thank God for their example and we should go forth inspired to emulate it. because sometimes I would swear I can almost hear his voice pushing me to be better. I had the honor to carry the stone and the story of Lt. James R. Zimmerman. I first heard about James after meeting his wife, Lynel at a wedding. Lynel and my wife, Danielle were childhood friends from northern Maine. I sat next to Lynel during the reception and listened to her and Danielle go back and forth telling stories of the past and sharing plans for the future. At one point during the reception, Lynel’s husband, James called her to say hello to everyone and to congratulate the new bride and groom. James was serving overseas with the Marines at that time but I looked forward to meeting him when he returned and we had planned for them both to attend our wedding. It wasn’t long after, when I heard the news that Lynel and the Zimmerman family had suffered a great loss. It didn’t know at the time that James and I would reconnect but here we are years later and I feel like I have come to know a friend. As the Unit Director of the South Portland Boys & Girls Club, I can speak for all the staff when we say that we take a lot of pride honoring our Veterans throughout the year. So when one of my staff, Jen Kirk came to me asking about the Summit Project, I first had to do some homework to make sure it would be good partnership for our organization. It took all of 1 minute on the Summit Project website before I was convinced that we had to join together. I also scrolled down to see what members of the fallen here in Maine had stones. When I saw that James was listed under “the honored,” I knew that it was a sign that this partnership needed to happen. The staff at our Clubhouse constantly strive to work with members about “being a part of things bigger than ourselves.” We are always looking for these teachable moments, but this moment found us. The event here on February 27th will be something that our members, staff, families and community will never forget. I served as a police officer in Portland for 7 years and here at the Clubhouse as Unit Director for almost 4 and it was one of the most emotional and impactful events I have ever been a part of. During the research portion of this project, I believe I have come to know James very well. I said that day and I’ll say it again, I believe he and I would have made great friends. Reading the stories and listening to his parents speak on the video, taught me that being a leader isn’t just another designated appointment but rather it’s earned day after day by the people who walk along side of you. I hope someday that I become a leader like James. I enjoy hiking and at times I get caught up just trying to race up to the top of the mountain but one thing that I have learned after server hikes, is that the view from the summit isn’t always the best. Often times the best views are the stops we take along the way and the people we share them with. I am going to try and stop more and reflect. I will never take for granted the sacrifices of the Fallen and the sacrifices made by their loved ones. I will do my best to continue to honor their lives and I hope someday to have an opportunity to sit down with the Zimmerman family. I look forward to more walks with James. My name is Kasandra Grover. I go to Nokomis Regional High School in Newport Maine. Right now I am a sophmore and I have the great honor of being apart of JROTC and the poms team. I carried the stone of 1st Lieutenant Zimmerman. I was greatly honored to carry it because I had participated in the 2016 Zimmerman Fitness Challenge. It was a great experience and I can’t wait to do it again next year! The Zimmerman Fitness Challenge was a real struggle. It was physically and mentally challenging. It felt like I had achieved something whenever I finished a station. It was overcoming an obstacle, but I never gave up even when it was hard. There were times when I wanted to give up but I didn’t because I just thought in my head “WW1stLZD?” which stands for “What Would 1st Lieutenant Zimmerman Do?” I just know he wouldn’t give up, so neither would I.
I had the great pleasure of meeting Mr. Zimmerman’s parents as well. When I saw that his name was on the list I didn’t have to think twice! I signed my name next to his stone.We climbed Big Moose Mountain and climbing it was a great experience. I would do it again in a heartbeat. I carried his stone for the Summit Project which honors Maine’s fallen heroes. Climbing the mountain was fun, but challenging. It was hot outside, there was mud everywhere, the bugs were biting, and some cadets had real struggles that they overcame. Whenever I got tired or felt like quitting I thought of 1st Lieutenant Zimmerman. I thought about his passion and drive to do good. I thought that if 1st Lieutenant Zimmerman was here, standing next to me he would give us all motivation to never give up. He never gave up and never backed away from a challenge. They overcome their fears everyday, and it just so happens that 1st Lieutenant Zimmerman helped me face mine. It was a great honor to carry the stone of 1stLt Zimmerman during the Baxter State Park climb up the Owl on 29 May, 2016. This was my first Summit Project event, and I had a fantastic time meeting with Tom and Jane Zimmerman, and hearing some of their stories about James. Though I never met James, I do feel a connection to him. Even before I moved to Maine in 2013, I knew that I would be serving in the 1stLt James Zimmerman building that is the home of my unit, Company A, 1st Battalion, 25th Marine Regiment. Knowing that James was not only a former member of Company A, but also served in the 6th Marine Regiment was a special connection that I am fortunate to share with him, and I proudly carried my French Fourragere up the Owl during the hike, and wrapped James’ stone with it during our Team’s summit ceremony. Knowing Marines who served alongside James, and the extremely difficult missions and high levels of enemy activity that he experienced in Marjah in 2010, I was very humbled to be chosen to carry the stone and the story of such a Warrior. I was particularly fortunate to have spent some time with Tom and Jane Zimmerman and hearing their stories about James. What gracious, courageous and caring people they are, and my wife Traci and I felt humbled to be in their presence. I feel that the group of hikers that I climbed with, Team Red, had a very strong bond, great chemistry, and the hikers on the team really understood the importance of the mission, and the honor that it was to tell our Warriors’ stories. From the hike up, to the summit ceremony, everyone had numerous insights, stories and characteristics about their hero that they shared, and I was honored to be able to share James’ story amongst such great people. I see James’ smiling face as the first thing that I see every morning when I walk into my unit, and this hike was very special to me. To be the one to carry James’ story and stone was a great privilege, and it was magnified by receiving the stone directly from his parents. I look forward to seeing the Zimmermans at future events, and am eager to hear more great stories about such an honorable and special Marine. “Today I, Alex, and my buddy, Jacob, were honored to have carried James’s stone up the mountain. He seemed like a very loving person and we greatly appreciate the opportunity to carry on his legendary story. I had the privilege of carrying James’ memorial stone and story to the summit of Cadillac Mountain on a beautiful 1st day of October as part of Team Kebo. Knowing how James would always carry more than his load helped me on my journey to the summit. His stone never became heavy, but his loss did. He was too fine of a person to have been taken so young. Heaven must have been in need of an Angel that day, and James would be the best Angel to ever serve in heaven. His commitment to those he served and those that served him was second to none. He was an excellent example of how a person should live their life. If only others could be half the man he was, this world would no longer have any problems. Though he had faults, he always persevered and carried on with the things that he did well. Trying to find things in common with James was harder than I thought. Failing is common to all of us, but the way he handled it was not, and I cannot say that I handled it like he did. The way he protected the kids being picked on was exemplary. I was the one that usually got picked last, or was the one that was being bullied. I would have liked to have James to help when I was young (or even now). He didn’t like school, and I did. The one thing that kept nagging at me was his birthdate. It seemed significant to me, but I couldn’t place it until I looked at my college diploma, and there it was…May 18th, 1985. I was just starting my adult life out in the real world, and he was just starting his life! From his college roommate, I heard a few more stories (that will not be repeated). Those stories reinforced the ideals that he lived by, just not the same situations. I wish you could have been at basecamp to receive James’ stone, but I understand. You were exactly where you needed to be on that day! The next time I see you, I will hug you and tell you about our hike, and listen to any story that you’d like to share. I have all the time in the world to learn more about James, and it would make my heart happy to listen and learn about him. At the summit, I shared the things we should do to honor James’ life: Speak up for others. Give them a second (or even third) chance. Be a better man. Make a difference in someone else’s life. And be good to your momma. I had the honor and privilege to carry the spirit stone Strength up the South Ridge Trail of Cadillac Mountain. In preparing for the hike, I reflected on the strength of the heroes whose stones and stories were carried by the hikers journeying that day to the top of the mountain. These soldiers all were physically, emotionally, and spiritually strong, as is evident in the reflections written by my fellow hikers. Most palpable on the hike, at the summit ceremony, and in reading the hikers’ reflections, is the spiritual strength of the heroes. Army 1st Sgt. Christopher Coffin “lived his life striving to make the world a better place for his country, for his troops, for his community, and for his wife,” and his life touched Mairin Gulliver, who felt “the mark that he left on this earth and how much better of a place we live in because of him.” Army Sgt. Joshua Kirk “led by example” (Shannon Kooser), and that spirit of leadership meant Sgt. Kirk was “a leader that anyone would be grateful to have as a friend” (Florence Dunbar). Maine Army National Guard Sgt. Christopher D. Gelineau was a true “person of good nature” (San Pau), who “continues to add light to the world and improves the lives of others” (David Cote). And there is another strength that I experienced on the hike and in the time spent with The Summit Project participants, staff, volunteers, and especially the Gold Star Families—the strength of community. By coming together to remember and honor the lives of Maine’s fallen heroes, this community transcends routine daily existence and creates a gracious space to experience the robust spirit and enduring influence of the heroes—the light they continue to add to the world. “Knowing how James would always carry more than his load helped me on my journey to the summit” (Mike “Bazooka” Peterson). Thank you for the opportunity to be a part of this strong community. I have brought these stories home to Arizona, where I will remember, honor and share the stories of the lives of Maine’s fallen heroes. I’ve been wanting to carry James’ stone since I met his parents, Tom and Jane Zimmerman at TSP BSP during Sunday breakfast. They were so encouraging with their advice about hiking Katahdin. They added to my layers of confidence and determination to hike that big mountain. Jane shared stories about James with several of us that morning. She touched my heart with her gentle voice and confident demeanor. The opportunity to carry James’ stone presented itself on October 18th when Kirsten White messaged me to ask if I would like to hike Mt Blue with her on Sunday October 23rd. She mentioned she had two memorial stones, the stones for Mark Goyet and James Zimmerman. When she asked if I wanted to hike with one of the stones my exact response was, “Really?!! I have Zimmerman on my hike list! Jane and Tom were so helpful in my prep for Katahdin and they shared so much about James that I wanted to honor him at some time.” It looks like James found me for this hike! Marine 1st Lt James R Zimmerman died on 11/2/10 in Afghanistan. I hiked with his stone on 10/23/16 to the summit of Mt Blue in Weld, ME. This was a steep, rugged 1.6 mile hike, summit elevation of 3,202. This day was an adventure to say the least. I had worried the remainder of the week that the weather might keep us from the hike; Saturday was forecasted with rain storms with Sunday being sunny but windy. I headed out on my own, from Newport, ME, around 5AM before the sun even whispered on the horizon, for a 7AM meet up. It was pitch black! Traveling in the darkness over country roads kept me very focused on this days mission. I drove in silence, with no radio on, only the chatter about James in my head. The wind was howling the entire drive to the mountain; clusters of leaves blowing across the road illuminated by my headlights. As I started up the road into Weld the sky was turning silver with the morning light and I saw snowflakes. Really?! We’ve got snow! I wondered if we were still going to hike. I met up with Kirsten at the Weld General store, we sat inside for a bit catching up. We realized we had been chatting for a while and we needed to get on the trail. As we were getting ready to get in our vehicles Kirsten handed me James’ stone. It was cold in my hands, very cold. After we got general directions from the store owner we headed up the road, James road shotgun with me as we made our way to the trail head. It was a gorgeous drive with all the trees in their autumn gold glory, with sputtering snow here and there. We won’t mention that we past the turn for the trail head road twice, allowing us to really enjoy the autumn scenery. We were finally headed up Mt Blue drive when we came to a downed tree in the road. It was a pretty solid pine tree, luckily it had split when it hit the ditch and there were no branches on the top. We had come this far, a tree in the road wasn’t going to stop us, so we picked it up and moved it to the side of the road. It was heavy! A gentle snow continued to fall as we geared up at the trail head. I adjusted James stone to lay horizontally in my pack, along the small of my back; it’s as if the weight was absorbed into my pack. It fit perfectly. I don’t usually talk much during a hike, unlike any other time when I am a chatter box. Kirsten and I shared stories about our lives and adventures, getting to know each other, along the trail. This was a challenge for me but I was able to find a talking rhythm to keep up my endurance. Did I mention the trail was steep and it snowed the whole time. Part way into the hike it was snowing pretty steady and Kirsten asked if I wanted to continue. Absolutely! The snow was not heavy and it was part of the adventure, what made this a good challenge for me. We continued on at a steady pace. I was committed to this hike and it reminded me to think of how dedicated James was to the Marine Corps and committed to his men. The elements of the wet, fallen leaves on stone, snow and cold temperature made this a hiking experience “first” for me. I was a bit out of my comfort zone. But with James’ stone in my pack and Kirsten’s positive encouragement this was an memorable adventure I was proud to be experiencing. We were the first on the trail for the day, no one around but us for the ascent. At the first lookout near the summit we got our first taste of what the trees had been protecting us from. The wind was fierce, blowing with 25 mph gusts and still snowing; it was raw. This WAS an extreme experience for me on a hike and I was thrilled about every moment of it. It made the mission of honoring James even more special for me. He was taking me on an adventure! We had a safe hike, although we were prepared for the cold and wind, we had not expected the snow. It would have been easy to say let’s not hike in this weather but carrying James stone made it a different experience; endure the challenge of the elements and honor a hero. We reached the summit to a blistering, cold wind. We quickly layered up, behind the protection of the station house, to make our way to the ledge near the observation tower. As we were getting the stones out two other hikers approached and asked what we had. We proudly shared with these two ladies the stones and stories of Mark Goyet and James Zimmerman and The Summit Project. We spent a few short minutes at the ledge, visibility was very limited, and it was very cold. We passed several pairs of hikers making their way up as we headed back down, at least we were the only ones out. I may have carried James’ stone up this mountain but his spirit carried me to push myself to new boundaries, and Tom and Janes words of encouragement about hiking continue to give me the confidence to challenge myself to explore new trails. I carried his stone for a day but I will always carry James’ spirit in my heart. Thank you James for finding me to go on a hike with you this year! Remember and honor. Semper memento. On October 30, 2016, I carried the stone of 1st Lieutenant James Zimmerman in the Marine Corps Marathon 10K in Washington, D.C. Every year for the last 5 years, I have run the race with Team Kelly, family and friends of 1st Lt. Robert Kelly, who died in Afghanistan in November 2011. I had lived in Washington, D.C. for the past several years but recently moved back to New England and have been in Boston since March 2016. This year I flew back to DC for MCM weekend and brought James’ stone with me. I spent Saturday morning at Arlington National Cemetery, James’ final resting place. Section 60 is always overwhelming, but for me it also is a place of comfort – where I am reminded that there is more good in the world than bad. As I walked among the endless rows of pearl-colored headstones, I felt overwhelmed not by sadness, but with pride and gratitude. The sense of service-over-self embodied by so many of those buried in Section 60 always humbles me. It is why I am proud to be an American, and the thing that brings me comfort when tragedy strikes – lifts me up when I’m feeling down or when I need perspective. I sat for a while at James’ headstone thinking about the man he was – fun-loving, compassionate, a protector and guardian. James and I grew up in similar circumstances – in rural Maine without all the comforts of modern living. We both spent childhood finding creative ways to have fun – in homes without electricity and running water. One might think that would make us naïve and sheltered about the world – but not James. On Sunday morning, after putting on my Team Kelly t-shirt, I slid my arms through a small backpack in which I had tucked James’ stone. At mile 3, my pace started to slow. I was tired, and the heat was getting to me. It was much warmer than usual this year – in the high 70s and humid. I have rheumatoid arthritis and had been suffering from flares for the past few weeks. Exhaustion set in, and I was in pain. I wondered if I had bitten off more than I could chew. Then I thought of a scene in a documentary I had watched a few weeks earlier. James had been interviewed during his last deployment. At one point, the video of James talking fades and merges with footage of his casket being driven home through the streets of Maine in the rain at night. Somber people line the street to welcome him home, carrying flags. They did not bother to mask their sadness or fight back the tears of grief over the loss of this strong young man gone way too soon. I suddenly felt I wanted to give James a different kind of parade. I picked up my pace and easily covered the next two miles, and at mile 5, I pulled over on the side of the course and pulled the stone out of my backpack. I wanted to carry it in my arms to the finish – to bring him “home” surrounded by cheers and shouts of gratitude. And I did. I held his stone like a football, shifting it back and forth from my right arm to my left. When I got tired, I just thought of that casket in the rain snaking through rural Maine, and it gave me strength. When I rounded the final turn to the last hill, I held the stone firmly with both hands in front of me, and then over my head across the finish line. People cheered: “Semper Fi, Marine!” They yelled, “Thank you, brother!” They jumped up and down – for James. It was exactly the sort of “homecoming” I had hoped to give him. But I never could have done it without him. As we mingled around the finish line, I kept James’ stone tucked into my right arm. Strangers came up to me and asked about “the rock,” and I told them about James – about his life, and about how he carried me across the finish line. I couldn’t be more proud to have carried a part of James with me during the race – to give him the kind of parade I think he deserves. I only hope some of his goodness rubbed off on me during the race. To James’ family, thank you for allowing me to honor him like this. I’ll never forget our run together. I hope it rings you some comfort to know he challenges and inspires me to strive for goodness every day. Kirsten, this is a beautiful reflection of your run with James stone. You are an amazing, strong, compassionate woman . Thank you for all you do to carry the memories our our beloved fallen heroes. On 22April, I was one of four athlete friends that joined up to participate in the 1stLT Zimmerman Fitness challenge at the UofME in Orono. While the four of us were experienced TSP hikers, most of us had never participated in an event like this one. So there was a bit of unspoken apprehension leading into it. Over the weekend, I was privileged to be able to carry the Memorial stones for three different heroes that were Black Bear alumni. My first ‘carry’ for the weekend was being able to transport 1LT James R Zimmerman’s stone from the Portland MEPS up to Orono, with an overnight in my home. This was my second opportunity to carry James’ stone. Holding his stone always reminds me of his strength, his resolve to get better, and the memory of the smiles he flashed in most of the photos of him that I have seen. I was honored to have it until it was passed over to his parents the morning of the event. Through nearly 3 hours of rain, mud and physical challenges, our team of four remained good friends, helping, joking, laughing and smiling as we made our way along the course. More than once someone said “What would James have to say right now?” Knowing that the goal was to be out there honoring the life of James helped us to keep perspective and keep it loose. I want to thank James’ parents, grandmother and family for being out there in the rain with us for this chance to honor his memory and sacrifice. It was a also a real pleasure to be able to spend some time talking with both Tom and Jane that day. I had the honor and privilege of carrying your son’s memorial stone to the summit of Mt. Owl on Memorial Day 2017 as part of The Summit Project’s annual hike at Baxter State Park. Both of you graciously took time to share your memories of James with me before and after the hike, which further enhanced the respect and connection I felt with him. James was an extraordinary son, brother, husband, Marine, American, and Christian. It’s clear to me that while he was taken from us too early he did not waste his time on earth. A great lover of the outdoors, James spent countless days adventuring in the wilds of Maine and beyond. These adventures no doubt laid the foundation for his great physical abilities that served him well as a Marine officer and are now held as a standard of excellence at the Zimmerman Fitness Challenge. More importantly, James used his talents to protect those less fortunate. As a fellow Marine infantry officer who commissioned the same year as James, I feel a special connection with him. I don’t know why James was taken and I was spared, but I will forever hold his memory close in my heart as a reminder to be the best son, brother, husband, Marine, American, and Christian that I can be. I am confident that everyone who hears James’ story will feel compelled to live to a higher standard and, in that impact, his spirit will live on. My name is Justin Cloukey. I live in Lincoln, Maine with my wife, Jessica, and 2 children, Kaelyn and Blake. I joined a special group of hikers on October 5th, 2017 on Cadillac mountain at Acadia National Park. During my day, I carried the stone and story of USMC 1st Lieutenant James Zimmerman. Although I have hiked before with TSP, this hike was special as I was able to connect with characteristics of James unlike other heroes I have hiked with before. The three major characteristics of James that connected most with James were that of leadership, protector, and a passion for physical fitness. Prior to the hike, I had participated in a Spartan Race in Killington, Vermont. This race was 14 miles with 8,000 feet of elevation and 30 obstacles. It was, physically, the most difficult thing I have done in my life. I had known I was carrying James’ stone prior to the race and my mantra was simple: “Keep going, this is nothing compared to what they have gone through”. It was equally humbling to be so physically exhausted that I felt I could go no further as it was to attempt to conceptualize the amount of training James did without hesitation while making my way through the course. From what I have gathered, James was a beast (and equally as fitting, the version of the race is referred to as the ‘Beast’). The Acadia hike was not overly taxing, which allowed me to frequently reflect on the mission and share stories of James and TSP along the way. At one stop during the hike, we had asked a family with children similar ages to mine to take a group picture of us. The nature of the picture naturally sparked questions from both the parents and the children. I had been carrying an extra stone shaped like a heart that I gave to the little boy, about 6 or 7 years old. His eyes became wide and had a newfound sense of pride. On the day of the hike, my protector role was on display hiking with my daughter, Kaelyn, who is 9 years old. She was as excited and prepared as any hiker present. As a father, I appreciated James’ commitment to family and ‘looking out for the little guy’. I shared Jane’s stories about James at the summit and knew he was smiling down at the gesture. Although I may have hovered a bit much over Kaelyn, I couldn’t help but have a feeling of pride that I could protect from a distance and let her soar in the clouds (literally). I presume this would be the feeling James would enjoy when in the protector role. The role of leadership is one that I feel should not be displayed on a one-time basis during a hike, but to live daily. I think James would agree, as he loved to lead. I was more surprised at my daughter by this characteristic, as she was physically leading our group for most of the hike. I smiled incessantly watching her will and desire to leading and asked myself “Who does she think she is, little James up in front?” The answer: most likely. This day was one comparable to James: unforgettable. A story of strength, purpose, protection and leadership. I appreciate the Zimmerman family for raising such a strong man with a stronger moral compass. Thank you. MHANF. It was a great honor to carry the stone of 1stLt James Zimmerman up Owl during the 2018 Annual Baxter State Park Summit Project Hike. This was the first Summit Project event I have participated in. I really didn’t know what to expect. I was assigned the stone of your son James. This felt like a good start to step off with, a fellow Marine. Upon check-in I met the two of you (Jane and Tom) and I immediately felt like a family friend and experienced an overwhelming sense of well-being hearing the stories and love shared from when James was a young boy, to young man, to a Leader of Marines. As I researched James, I was amazed at how many people really knew him. The stories and tales I heard spoke more towards James as the individual, the person, and not just the First Lieutenant. I never knew him, but after talking to others and hearing a variety of stories and memories I felt a connection with him and the life he lived. James has always been part of something bigger. Being an original protector from the start, standing up for individuals that were unable or unwilling to stand up for themselves. James was a natural leader. James had a way about him that others wanted to follow. James truly led from the front. “Z” as he was referred to from fellow Marines that served with him, stated that he was the greatest Marine they ever knew. James is exactly what it means to be a Marine. James is the embodiment of what young men and women strive to be when they want to be part of the Marine Corps. Mission accomplishment and troop welfare are the two things being a Marine we pride ourselves on. Self-less service, and kneecap to kneecap leadership, being a true mentor to everyone around and looking at the whole Marine concept, vice one simple good or bad point are things that natural leaders do, actions that make others want to follow them, these are the traits and actions that are extremely hard to find in today’s ever changing force in readiness. James did these every day, because it is in his DNA, it is in his drive, it is who he is. And a little of James is part of anyone who ever met him. They say the Stones pick the hiker. I believe this, I am an Active Duty Marine. Currently serving in the 1stLt James Zimmerman building in Brunswick Maine. Having friends that served with James during the good and challenging times. Every morning I walk into the building I see a picture of James on the wall with him smiling and hearing a voice of a Marine from the stories I was told. It was a great honor to not only carry the stone of 1stLt James Zimmerman, but more of an honor to learn about him, meet his family, and be part of something bigger than itself. Hi, My name is Cade and I had the honor of taking the stone of Marine 1st Lt. James R. Zimmerman during the summer project that our JROTC does yearly. It was an great experience to me and my peers and taught me the life lesson of never giving up. AN couple times during the hike I wanted to quit because I was tired and my legs hurt but every time I thought about that I thought to myself ‘remember who and what I’m doing this for’ and that stone in my bag was the reason I fought through the pain. It was because that stone that brought me the motivation to finish carrying the stone of an hero in Maine who risked and sacrificed his life to keep ours safe. I wanted to take Lt. Zimmerman’s stone because of the past couple years I’ve been doing the annual Zimmerman challenge at The University of Maine in Orono that his parents have been putting on to honor his sacrifice. I realized a couple of weeks before we did the summit project that I wanted to remember him more than just doing the Zimmerman challenge, so I asked the Colonel at my school, Nokomis, if anybody was taking his stone and he replied no. So I took that advantage and chose his stone to remember him that way also. I know for an fact that he is looking down at us, smiling down at us with his great smile. He would be proud of everybody that remembers him and all of the soldiers of Maine and all around the world.It was my greatest honor to carry Marine 1st Lt. James R. Zimmerman to the summit and I hope and pray that I get the honor of doing it again next year. I had the honor of carrying the stone and story of First Lt James Zimmerman during the TSP hike in Acadia national park. During this hike we summited Dorr and Cadillac Mtns. This is the second time I have carried James stone. I was honored once again to share his story. I had the pleasure of meeting his parents during the Baxter event in May, and I was pleased to be assigned his stone once again. As my final hike as an active duty Marine, carrying James stone has made my career come full circle. My condolences once again to Tom and Jane Zimmerman. Semper fidelis. I work for a non-profit in Bangor and we currently have the honor of hosting the display of stones. What a tribute to these fallen heroes. As i watched the video for James my heart just aches for his folks. This young man had such a deep impact on not only his soldiers but all who knew him. I want to with you a Happy Valentine’s Day and thank James for his service to our country. Thank you! !